Whalers and fur traders took polar bears out of the Canadian portion of the Beaufort Sea (documented by Honderich 1991, see discussion here) but they almost certainly killed them in large numbers in the Southwestern Beaufort and Chukchi Seas as well (see Fig. 1 above). As in the Eastern Arctic, polar bears in the Pacific sector were likely killed (along with walrus and seals) in the late 1800s especially, since by that time the western (Pacific) stock of bowhead whales had been severely depleted (Bockstoce and Botkin 1982; Bockstoce 1986). Because of the rather peculiar geographic position of St. Matthew, Klein and Sowls (2011) suggested recently that fur seal hunters and Revenue Cutter operators, rather than whalers, are probably to blame for the overhunting there. Henry Wood Elliott wrote this account for Harper’s Weekly Journal of Civilization in 1875. Elliott was a U.S. government biologist studying fur seals on the Pribilof Islands and overseeing the harvest of their skins, used to make fur coats. 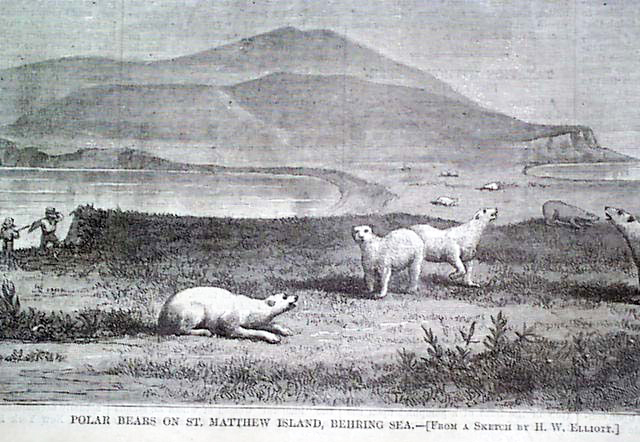 In 1874, he made a trip a few hundred miles north to St. Matthew Island to confirm the rumor of hundreds of polar bears that spent their summers on one of the most remote islands in the Bering Sea. Elliott and his party explored the island for nine days and had polar bears in sight each minute. He estimated there were at least 250 bears on the island, and the bears seemed in excellent condition, though they were molting their winter fur. This summer , there are no polar bears on St. Matthew Island. None have spent their summers on the 32-mile long, 4-mile wide island in more than a century. In the summer of 1899, members of the Harriman Expedition visited St. Matthew and found — to their great disappointment — no polar bears. Sailors on U.S. government Revenue Cutters put a dent in the St. Matthew summer polar bear population in the late 1890s. Patrolling the Bering Sea to prevent poaching of fur seals, seamen sometimes went ashore on St. Matthew and killed bears for the thrill of the hunt. Crewmembers of the cutter Corwin killed 16 polar bears on St. Matthew sometime in the 1890s. 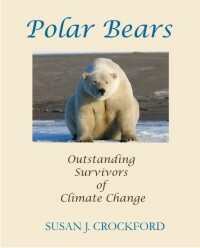 This is the last report of polar bears on the island, Klein writes. Regardless of who is to blame for the carnage on St. Matthew, the bears in the Chukchi subpopulation appear to have recovered considerably now that the wanton slaughter has stopped (see previous post here), leaving open the possibility that they may re-colonize the island of their own accord when conditions are suitable. In this regard, Elliott’s notes on his 1874 visit are a gold-mine of information. Elliott’s government report (Elliott and Coues 1875: Appendix) notes that the bears they saw were “in most excellent condition, fat and sleek.” They encountered both males and females with twin cubs. Maynard’s report apparently mentions twins and triplets – “about one third grown” (cited in Klein and Sowls 2011:430), i.e. one year old cubs. Elliott and Maynard found empty maternity dens that had been dug into the hillsides and “bear roads” winding around the island. Fresh water was abundant on the island and while there were walrus and a few seals offshore, there was only scant evidence (the carcass of one young walrus) that the bears were feeding on them. The bears appear to have been fasting – except for the odd bit of scavenging and grass-chewing, which all land-bound polar bears appear to do. The Bering Sea ice that surrounds St. Matthew in winter is all first year ice sitting over very productive waters – seals there are plentiful. All things considered, the St. Matthew polar bear circumstances sound eerily like the polar bear subpopulation that lives in western Hudson Bay (see previous post here) – including the production of twins and triplets. However, there is one difference I noticed – the length of time St. Matthew bears must have spent on land. The retreating sea ice forces the bears of western Hudson Bay to come ashore in late July or early August each year, leaving them on land for about four months – until the end of November or early December. How long 19th century St. Matthew bears had to spend onshore depended on when the ice left and when it returned. Sea ice cover on the Bering Sea (like the ice on Hudson Bay), is highly variable. Recently, this variability has been shown to be quite normal (see Brown et al. 2011 and previous post here). 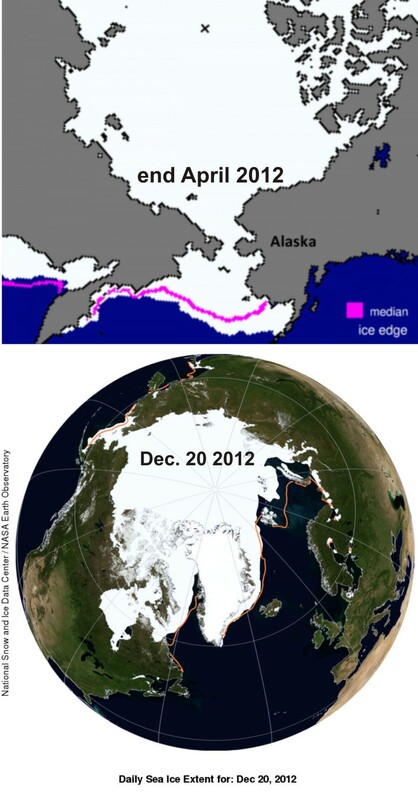 In 2012, there was record-breaking sea ice cover on the Bering Sea (see Fig. 3 below) and by the end of April, St. Matthew Island was still completely surrounded by ice. It appears not to have retreated beyond the island until early June and in the fall, the ice did not return until mid-to late December (see Fig. 3 below). Figure 3. 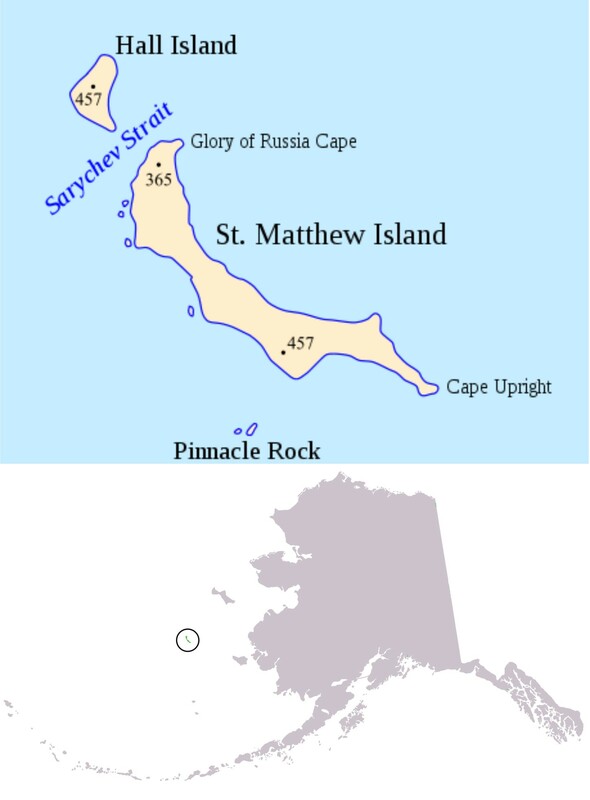 At the end of April 2012, St. Matthew Island was still well surrounded by ice and did not clear the area until at least the end of May. The ice did not return to this region until mid-to-late December 2012. Ice conditions were somewhat more severe than this in 1875, when Elliott saw bears spending the summer on St. Matthew: then, the ice did not retreat until late June (about a month later than 2012) and was perhaps back again by late November. Modified maps from NSIDC. Click to enlarge. The sea ice behavior for 2012 gives us some insight into what the sea ice conditions were probably like in the late 1800s: at the time Elliott and Maynard visited St. Matthew (August 5-9, 1874), they noted that the sea ice was gone by the end of June (Elliott and Coues 1875: Appendix), about one month later than 2012. This means that if the ice returned to St. Matthew about one month earlier in the fall than it did in 2012 (i.e. mid-to-end November instead of mid-to-end December) – as seems likely – the polar bears of St. Matthew, including pregnant females, were spending at least one more month on land than bears do now in western Hudson Bay (unless it can be shown that the ice in the late 1800s returned as early as mid-to- end October). 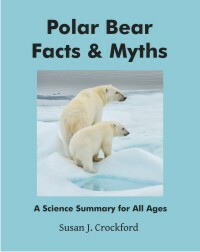 Since it appears polar bears had adjusted to surviving a five-month-long summer on St. Matthew in the late 1800s in similar habitat, it suggests that Hudson Bay bears could do the same, if the need ever arises. Bockstoce, J.R. 1986. Whales, Ice, and Men: The History of Whaling in the Western Arctic. 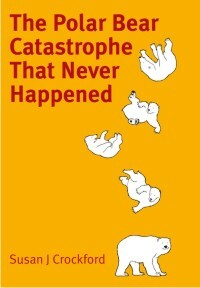 University of Washington Press, Seattle. Elliott, H.W. 1875 . Polar bears on St. Matthew Island. Harper’s Weekly Journal of Civilization. May 1 issue. Harper and Brothers, New York. This entry was posted in Life History, Sea ice habitat and tagged Bering Sea, Chukchi, commercial harvest, Elliott, Hudson Bay, Klein, onshore, Rozell, sea ice extent, St. Matthew Island, triplets. Bookmark the permalink.